Winter Feeding It was much easier MIG grazing; Just move the strand of wire while enjoying the sunshine. Now we're using equipment to unroll round bales across the snow. Next year we'll experiment with stockpiling forage for winter grazing. No equipment. No un-rolling. The plan is to plant endophyte free fescue for winter forage and ...continue reading "Winter Feeding"
Today it seems like everyone is prepared for whatever Mother Nature throws at them. Cell phones, GPS, four wheel drive, and accurate weather forecasts give a feeling of safety. A false sense of security blankets our instinct to avoid dangerous situations. Because we farm - we're weather dependent. We plan for worse case scenarios like ...continue reading "The Blizzard of 1888"
Last week's storm had me breathing a sigh of relief. I'm hopeful that the summer drought pattern is being replaced with soaking fall rains. The few summer storms we've had haven't brought significant accumulation. Unfortunately though, along with the rain came hail. I couldn't sleep because I was waiting for the skylights to shatter. They ...continue reading "Goodbye Summer"
Poultry Feed I love this picture. The grasshopper catcher is a perfect example of Necessity being the Mother of Invention. Insects are a great source of protein. Free range poultry fill up on grasshoppers keeping the pests under control. It's a seasonal feast, though. 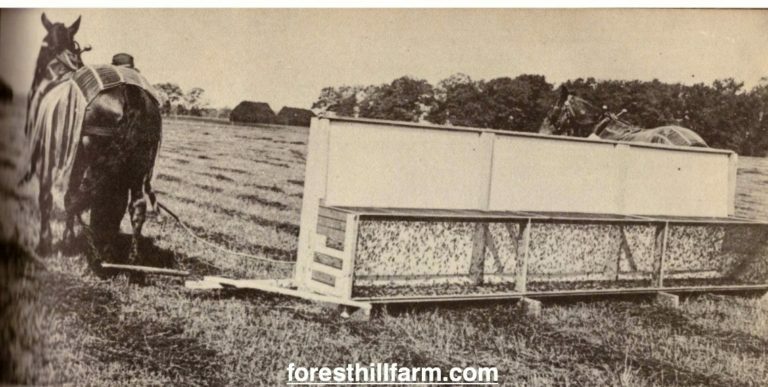 The pioneers solved this by catching grasshoppers in the hayfield and ...continue reading "Poultry Feed"
Death to the Drones! My style of hive management is relaxed. I start fall feeding when I see the workers killing the drones. Drones are male bees created from unfertilized eggs. 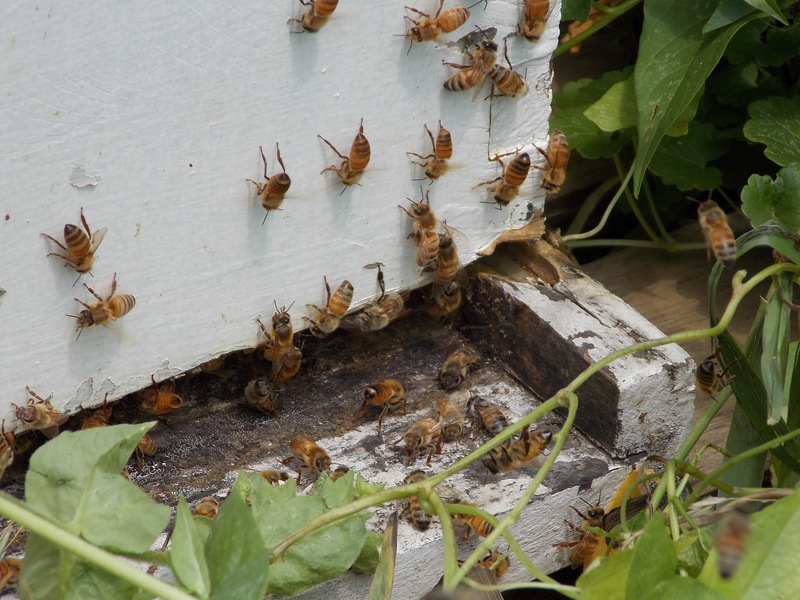 There are between 500 and 1,000 drones in a typical hive of 50,000 – 60,000 bees. A drone's only job is to fly out ...continue reading "Death to the Drones"
Fodder This winter we’re experimenting with growing fodder which is sprouted barley seed. Throughout the winter we're feeding it to a select group of sheep, pigs, and chickens. This green feed, that’s high in protein, is fed with hay and minerals. 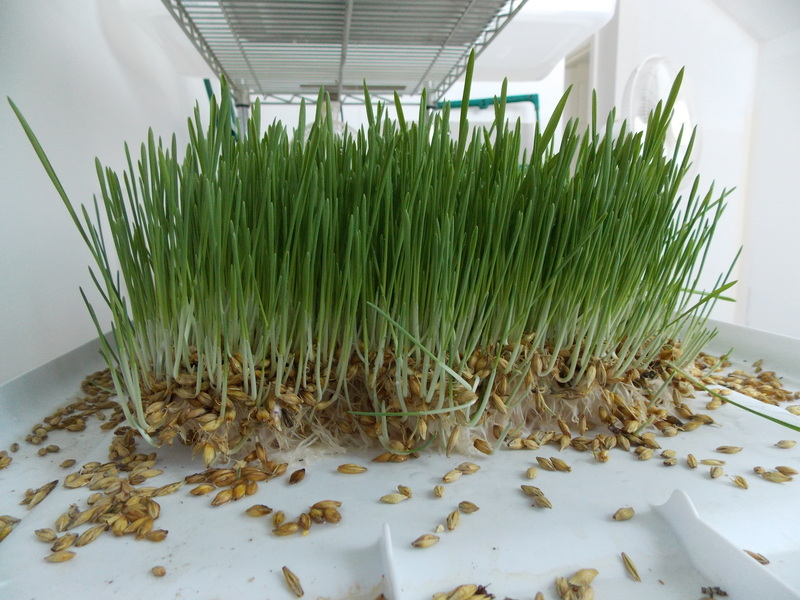 The recommended method of growing fodder is to soak the seed in water with ...continue reading "Growing Fodder"
Drought conditions continue to dominate the news. We've decided to have a positive attitude towards whatever life throws at us. If it's out of our control, it's out of our scope of worry. The site below has maps tracking drought conditions in the United States since 1896. The data is fascinating. Take a look at ...continue reading "Drought Footprint from 1896 to 2012"
With all the new lambs born recently we’re feeding the richest hay in the mow. The more coarse hay is fed first. As winter progresses the hay supply is dwindling. The highest quality hay is held back until the end of winter. It’s reserved for cows, who are nursing calves, and ewes nursing lambs. Keith ...continue reading "Save the best for last"
The Eagle’s Spirit This past week we’ve enjoyed watching the live internet stream of the eagles nest at the Decorah Trout Hatchery. The eaglets hatched and the parents had a rabbit along with a collection of small birds to feed them. Here in north east Iowa bald eagles are prevalent. All winter there are a ...continue reading "The Eagle’s Spirit"